In Mrs. Randolph’s fourth grade Burnsville Elementary School class, substitute Britt Kaufmann encouraged 21 students to let their imaginations run wild. Britt introduced students to a 1984 picture book, The Mysteries of Harris Burdick. The book consists of a series of highly detailed images each accompanied by a title and a single line of text. Each student chose an image as a jumping point to create their own stories. On the second day of a multi-day sub visit, sixty 10-12th grade high school students enjoyed using woodless pencils and large format paper with substitute True Kelly. True instructed students in the art of portraiture; drawing each other and themselves. They explored various methods in the depiction of the face with line, color, shape, textural surfaces, contrast, and rhythm in their work – a great follow up from the previous day of allegorical drawings. Substitute True Kelly spent the day with 60 10th-12th grade high school students discovering the animal within! Students created allegorical self-portraits by combining the unique aspects of particular animals with their own human characteristics. Within the study of animal features, True discussed the differences between celebrations and ceremonies in traditional and indigenous cultures. Students were challenged to expand their own self-awareness; their drawings brought surprise, laughter, and joy into the experience. Katrina Plato spent the day with 70 third-fifth grade students teaching a lesson on texture. Students did multiple texture rubbings to understand how different objects feel differently and have a different visual look because of their texture. 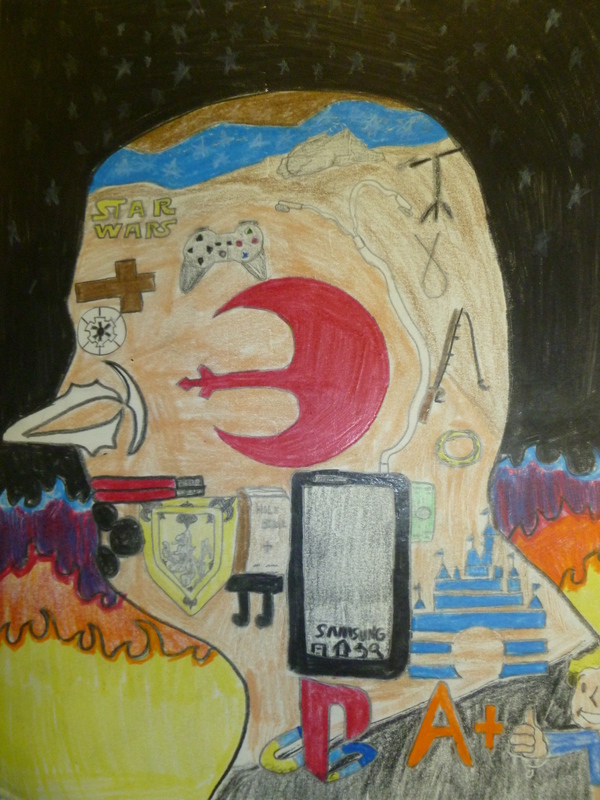 Students then designed their own image using various textures to color in the form of the drawing. Over two days, Anne Phillips worked with 160 sixth grade students to bring ancient Mayan civilization to life. 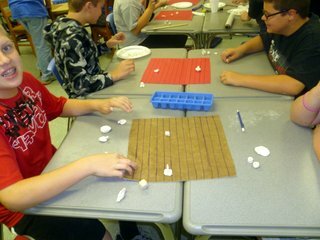 Anne provided each student with instructions and inspiration to create their own version of the Mayan game “Bul.” Instead of burnt corn, sticks, and shells, students used clay and cloth to create 1 playing board, 1 die, and 10 playing pieces. Anne brought pictures of traditional Mayan statues and symbols as inspiration for playing pieces. The rectangular cloth was divided into 14 columns to create a playing board. And then the playing ensued! Students grouped into pairs and rolled the die to see who went first (highest number first). To move, the student rolled the die and moved a playing piece forward the correlating number of spaces (on the lined cloth board). Each turn consists of two rolls and you move your piece or pieces (you being to bring in your other pieces) forward. When you reach the end of the board you turn around and begin moving back. The object is to land on the same space as your opponent and then use the die to roll your way back to your side of the board with your opponent’s captured piece, thus killing his piece. The game continues until all of one player’s pieces are dead. 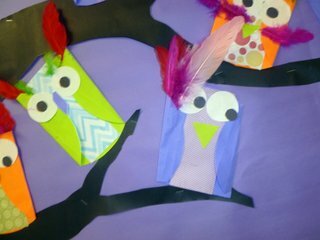 In the Classroom: A Hoot! Did you know owls don’t move their eyes, they move their whole entire head? Anne Phillips spent the day with 22 Kindergarten students using the owl as the basis for a lesson in geometric shapes and the 5 senses. 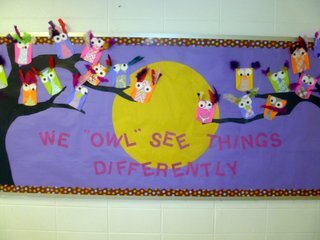 After sharing facts about the owl, each student was provided with a variety of geometric shapes to create their own owl. 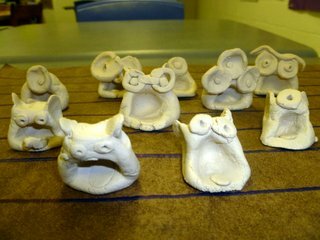 Each student selected 1 large circle for the owl body, a rectangle for the belly of the owl, and other shapes until they created circle eyes, a triangle beak, and so on. With a few simple folding techniques everyone had their own owl creation. At the end of the day Anne showed students how to create different owl expressions by placing the circles in different locations – paying special attention to ‘sight;’ one of the five senses.